Yosemite West has been awarded nine grants totaling more than $840,000 for hazardous fuel reduction between 2005 and 2017. The grants are a direct result of YWPHI's effort to help the entire community. The successful completion of these hazardous fuel reduction projects with full inter-agency cooperation benefits all of Yosemite West. The following table summarzies the grant projects that help to protect your property by potentially reducing the threat of catastrophic wildfire to the community of Yosemite West. Yosemite West property owners John Mock, Ph.D. and Kimberley O'Neil resigned from their roles with YWPHI and the YWPHI Fire Safety Committee (2003-2012) after successful completion of the five National Fire Plan grants. Motivated by the extreme drought conditions, they again served as Grant Liaisons between YWPHI and granting agencies between August 31, 2015 and 2018. The result of these efforts is that YWPHI was awarded four more grants. 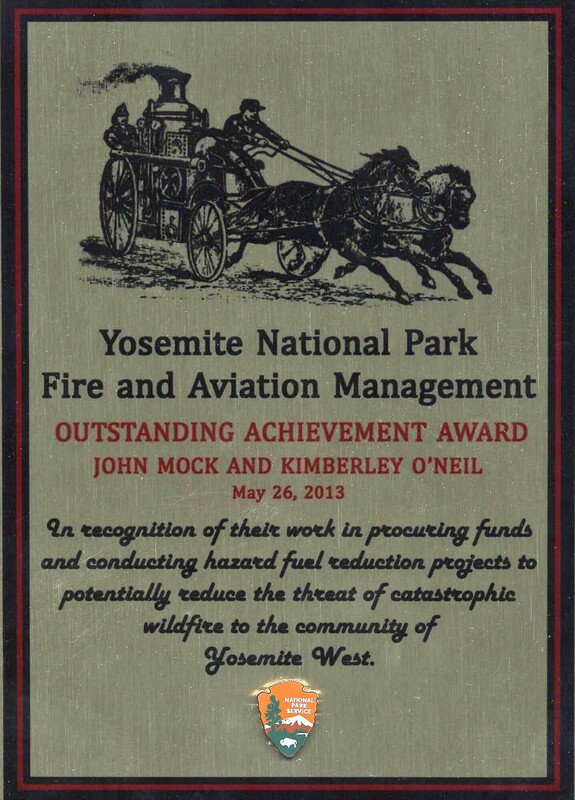 Yosemite National Park Fire and Aviation Management recognized their community service in 2013 with an Outstanding Achievement Award. "After your many years of dedication to your community and making it more secure � I want to congratulate the two of you for your outstanding work. I must say that out of all of the projects and programs we have been involved with � this was easily the best managed. Much of how you approach your work � and your level of commitment is truly exemplary. Please let me extend my heartfelt appreciation for everything you have accomplished. You were true professionals with significant accomplishments." Steve Haze, Executive Director, Yosemite/Sequoia RC&D. YWPHI is a registered non-profit organization in the State of California, but it is not exempt from paying federal income taxes because it is not a 501(c)(3) exempt organization. To avoid federal tax liability on grant funds, YWPHI cannot receive or distribute any funds directly. The Yosemite/Sequoia Resource, Conservation & Development Council (RC&D) agreed to be the fiscal sponsor for YWPHI, and has been serving as such since the first grant was awarded in 2005. The grant funds flow from the funding agency to the grantor directly and then to the Y/S RC&D, and from the Y/S RC&D to contractors, etc. View a diagram showing how grant funds flow. Please email grants@yosemitewest.org with any questions you may have. Copyright text © Yosemite West Property & Homeowners, Inc. 2003-2018. Copyright photographs © John Mock 2004-2018. All rights reserved. Unauthorized redistribution of this document is prohibited. Updated June 15, 2018.